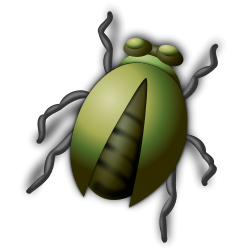 The Dolibarr bug manager allows you to report to Dolibarr team development, any bugs you find on software. * Read the bug tracker to see if bug is not already reported. If yes, do not submit another ticket. * Try to find an answer in the Dolibarr forum. May be the bug is already reported. * If you did not find the bug, report it and describe the way you can reproduce it (version of Dolibarr, type of database: mysql or postgresql, menu you used to reach the page, data you type as inputs, ...).